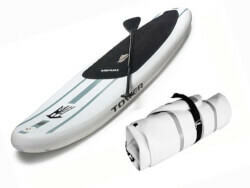 This inflatable Stand-Up Paddleboard (SUP) is a great board for beginner paddlers and newcomers to the sport. Know someone moving to a place that's warm and beachy? This SUP is a thoughtful send-off gift!